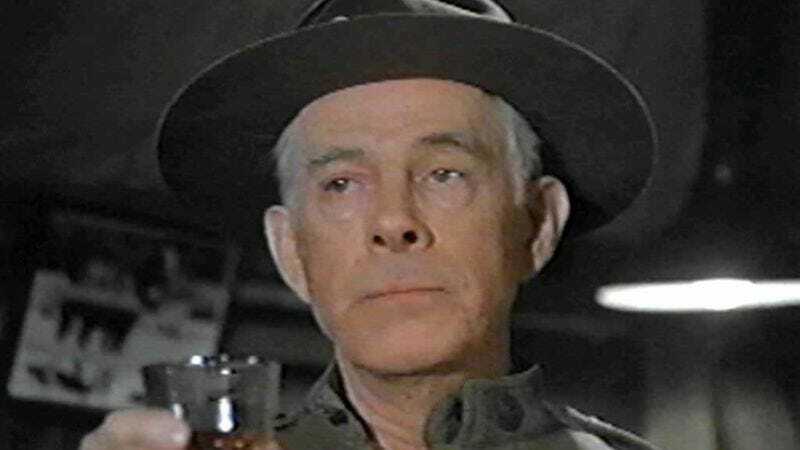 Numerous sources have reported the death of Harry Morgan, an actor whose career included roles in more than 100 films and a co-starring lynchpin performance on TV's Dragnet, but whom is probably best remembered as the acerbic yet adorable Colonel Potter on M*A*S*H. Morgan died after suffering from pneumonia. He was 96. The part of Potter came about as something of a fluke: Morgan stepped in to replace the exiting McLean Stevenson at the end of the third season, having impressed the producers with a one-off role as the daffy Major General Steele in a first-season episode. As Potter—an Emmy-winning role that Morgan would portray throughout the rest of the series' run and on into AfterMASH—Morgan brought an irritable yet kindly edge to the career officer who’s charged with overseeing the wacky shenanigans of the 4077th, a put-upon father to a unit of overgrown kids who often expressed his anger and disappointment, as any father would, through imaginative not-quite-profanity like “Buffalo chips!” and “Sweet Nefertiti!” Morgan also brought several personal touches, such as his own love of raising horses and the oft-glimpsed photo of Potter’s wife, a picture of Morgan’s real-life bride Eileen. Morgan had an early big-screen breakout with 1943’s The Ox-Bow Incident, where he and Henry Fonda played suspected cattle rustlers who get swept up in murderous posse out for vengeance. It was just one of many Westerns to come for Morgan, including the classic High Noon, How The West Was Won (where he starred as Ulysses S. Grant), and The Shootist, along with the Western spoofs Support Your Local Sheriff, Support Your Local Gunfighter, and Disney’s The Apple Dumpling Gang. Other notable film appearances included The Teahouse Of The August Moon opposite Marlon Brando and Glenn Ford, and playing the judge in Inherit The Wind and the pianist to James Stewart’s titular bandleader in The Glenn Miller Story, one of several films he would make with director Anthony Mann. Morgan’s TV résumé also included a starring role in the short-lived ’60s sitcom Pete And Gladys, as well as playing a jockey assisting Dennis Weaver’s horse rancher in NBC’s Kentucky Jones, the con-artist father to Hal Linden’s crime-solving magician in Blacke Magic, and the elderly Professor Suter on 3rd Rock From The Sun. Throughout it all, Morgan practically created an archetype of characters whose sharp, rough edges belie their squishy centers, becoming one of the most memorable, loveable cranks in pop culture.